When it comes to heavy-vehicle accident Recovery Truck, Adelaide Truck Towing has been helping drivers around Adelaide, as well as the rest of the country, for years. Our vast experience has helped us to develop the most advanced techniques using the best machinery and equipment available, striving to prevent any further damage to the vehicle. No matter the circumstances, we always aim to reduce any loss of freight, as well as infrastructure disturbance. We know road accidents are never planned, which is why we are always on stand-by and endeavour to respond to calls as quickly as we can for Recovery Truck. From the moment we arrive on the scene, we take care of the safest possible recovery of the load, as well as cleaning up the accident scene, and make sure the costs are fair and reasonable for you and the insurance company. Aside from being shocking, road accidents can also be quite devastating, so the wellbeing and safety of the driver is always our top priority. Once we ensure the driver is safe, we are able to contact their loved ones, and then transport them home, or to other accommodation. With our team on the scene, you won’t have to worry about a thing. 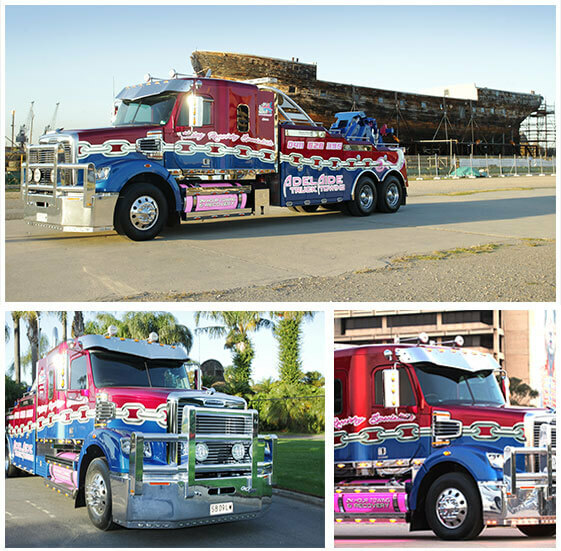 Adelaide Truck Towing is a family-owned business based in Burton, South Australia. Our powerful and iconic fleet of trucks responds quickly to drivers who need heavy-vehicle towing or accident recovery anywhere in Australia. We strive to transport commercial vehicles as quickly, carefully and efficiently as possible.